To Order "Augusta County, Virginia, Earliest Will Index, 1745 to Post 1900"
mail to: 701 Donaghe St., Staunton, VA 24401-2838. Phone: 540 885-1357 or email to societydame@verizon.net . NOTE: This book is in its 2nd printing. There are only about 30 copies remaining. Get your book before it goes Out of Print. 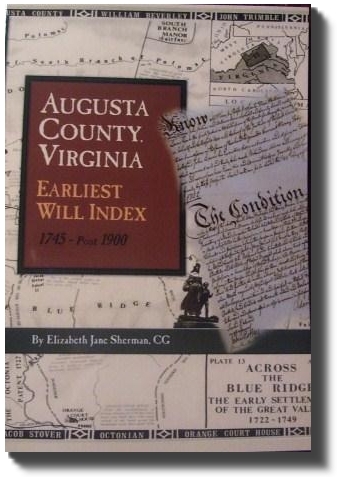 BOOK NEWS: VA Genealogist Janie Sherman Publishes Augusta County Will Index Book. Staunton, VA (HNN) -- Janie Sherman, a Staunton-based certified genealogist whose specialty area is Augusta County, VA, has published a book with Gateway Press, "The Augusta County Earliest Will, 1745 to post 1900." Today's Augusta County is the Old Dominion's second largest county, with 970 square miles of area. Its county seat is the independent city of Staunton. Back in the day, the county included the present states of West Virginia and Kentucky, as well as much of the area north of the Ohio. Virginia claimed all the land to the Pacific Ocean, in fact. The 280,000 square mile Northwest Territory -- today's Ohio, Michigan, Indiana, Illinois, Wisconsin and part of Minnesota and bigger than today's state of Texas --- was formed from Augusta County when Virginia relinquished its claim in 1784. As Augusta County once included West Virginia, Kentucky, Indiana, Ohio and neighboring Tennessee and North Carolina, many residents of Appalachia and much of the Midwest today have ancestors from Augusta County, VA, Sherman said. Besides the No. Will Index Book, Sherman has included 4 additional will books, 2A through 5A, that pertain to wills of the late nineteenth century and early twentieth century. The earliest will, that of Robert O. Wilson, dates 3 Nov 1745, and the old index is not in alphabetical order. 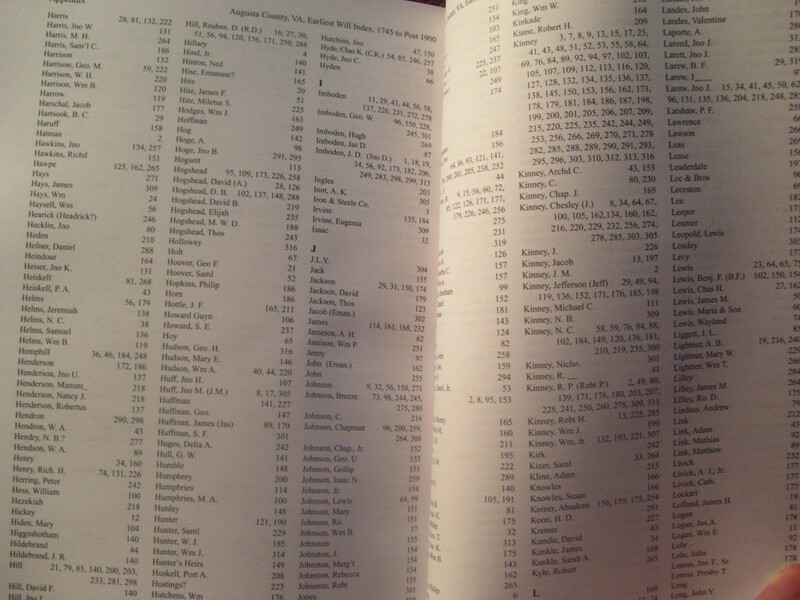 "Not only is the published index in alphabetical order," says Sherman, "but it contains genealogical documents of interest that one might not suspect as early as 1745." She said the book contains estate matters such as, wills, codicils, and administrations, property inventories, appraisals, settlements and sales; but also random documents pertaining to emancipation of slaves, bonds, liens and crop loans; guardianships, apprenticeships, indentures, and marriage agreements and separations; nominations for public office and military qualifications, promotions and appointments; power of attorneys, widow relinquishments, recantations, executor appointments, deed of gifts, trusts, surveys, contracts and agreements. "It's more than just a will index book," adds Sherman. "It is a gateway to the collection of Augusta County cultural history and valuable documentation needed for the many family histories that are being researched today. Genealogy has become the number one hobby in America, and with old Augusta County being so vast, many will find their roots right here. In addition, I have added an Appendix Index that includes a list of all names mentioned within the context of the Will Book entry. This published work will allow researchers all over the nation to have access to these grand Augusta County records." "In genealogy classes that I have presented for 10 years, I ask, 'Doesn't EVERYBODY come from Augusta County?' Before the Revolutionary War, this county once stretched from the Blue Ridge Mountains to the Mississippi River and up to the Great Lakes. It was huge! Also it contained the Great Wagon Road, a north-south migration path to the southern and western territories. If your ancestor didn't live here, then they may well have passed through," she says. "Furthermore, we are so fortunate to have an Augusta County Courthouse that is not a 'burned courthouse' neither by war or accident, thus, the early records have been amazingly well preserved beginning with the clerk in 1745 to the present clerk, John B. Davis -- 260 years of wills and deeds recorded since 1745."